GAURANTEED APPROVAL BUY HERE PAY HERE AVAILABLE Proof of Income, Proof of residence needed for approval You can apply online @LANDOFCARSOKC.COM or come in and we can do it for you You can reach us at (405)603-8283 !~!~!~! WE WORK WITH ANY SITUATION THAT YOU'RE IN SERIOUSLY ANY! ~!~!~! Excellent Credit Good Credit Bad Credit (Repos, Divorce, Bankruptcy, No Co-Signer, Multiple Repos, Student Loans) No Credit First Time Buyers Child Support No Driver's License Necessary No Minimum Job Time required Low down payments DOWN PAYMENTS LISTED ON THE WEBSITE ARE BASED OFF AVERAGE CREDIT. MONTHLY PAYMENTS BETWEEN $150 -$400 MAX You can apply online @LANDOFCARSOKC.COM or come in and we can do it for you You can reach us at (405)603-8283 OUTSIDE WARRRANTY INCLUDED FOR ALL VEHICLES OVER 150K MILES, BESIDE CERTAIN MAKES AND MODELS .Trade-ins are welcomed (any condition) OUTSIDE WARRANTIES AVAILABLE FOR ALL VEHICLES BESIDE CERTAIN MAKES AND MODELS (call us for more info) WE accept ITN, SSI, SSD We have multiple finance programs available for everyone and any situation cash price $$$ 3495.00 $$$ cash price !~!~!~!~! WE OFFER 90 DAYS THE SAME AS CASH !~!~!~!~! !~!~!~!~! PAY OFF IN THREE MONTHS WITH 0% INTREST !~!~!~!~! !~!~!~!~! $0 DOWN WITH TRADE-IN !~!~!~!~! DOWN PAYMENTS CAN VARY FROM $0 DOWN TO OVER THE AVERAGE REQUIRED APPLICATION IS NEEDED TO DETERMINE YOUR DOWN PAYMENT. 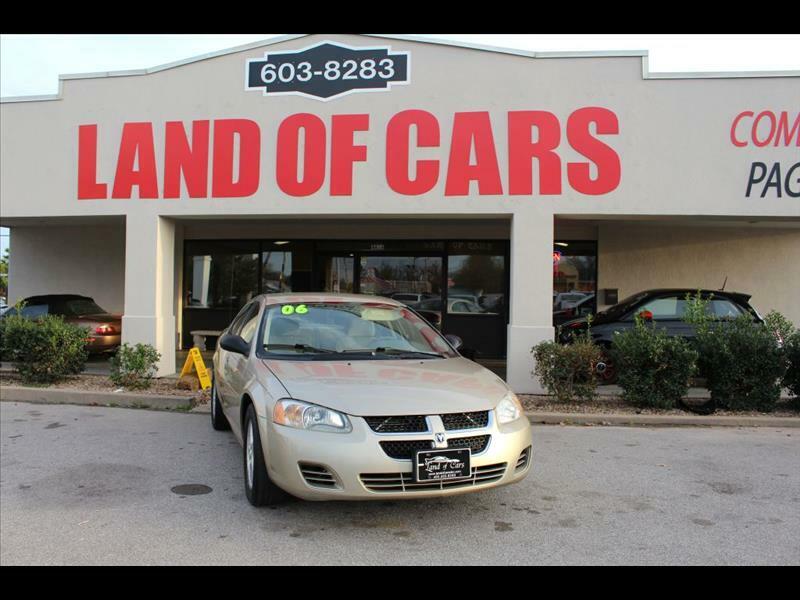 Visit Land of Cars online at landofcarsokc.com to see more pictures of this vehicle or call us at 405-603-8283 today to schedule your test drive. Message: Thought you might be interested in this 2006 Dodge Stratus.